East Bay chocolatiers won big at the fifth annual San Francisco Chocolate Salon — but of course they did. Results have just been announced for the Salon, which was presented by TasteTV at Fort Mason Center on April 17. Over fifty chocolatiers from all over the US and beyond shared their wares with the public and with food-journalist judges, including yours truly. 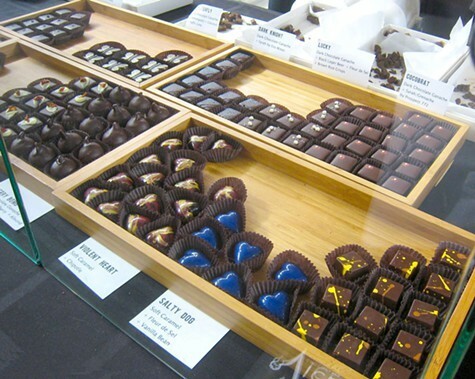 Oakland's Vice Chocolates won a gold medal in the "Most Delicious Ingredient Combinations" category. Owner I-li Brice creates intriguing fusions in her hand-rolled truffles, caramels, and bars. Just to name a few: lemongrass, chili, kaffir lime, pear, galangal, bergamot, and gold and silver dust. Brice will have to struggle under the weight of lots of metal because Vice also won silver medals in the "Best Caramel," "Most Luxurious Chocolate Experience," and coveted "Most Gifted Chocolatier" categories, plus bronzes in the "Best Truffle," "Best New Product," "Best Flavored Chocolate Bar," "Best Gift Set," "Best Presentation," "Best in Salon," and "Top Artisan Chocolatier" categories. Vice's booth at the San Francisco Chocolate Salon. Featuring the creations of Swiss chef Heinz Rimann, San Leandro's The Tea Room won a gold medal for Best Flavored Chocolate Bar. TTR's repertoire includes bars flavored with star anise, raspberry rooiboos, chamomile, honeybush caramel tea, green yerba maté, jasmine tea, piña colada, chai, and green Earl Grey.They're very affordable at $2.99 each, and despite recent political mayhem in Ivory Coast that is sending cocoa prices through the roof, "we're doing everything in our power to keep our prices exactly where they are," said TTR's Ethan Ash. "We're keeping our fingers crossed." The Tea Room also won another gold medal for "Best Flavored Chocolate," a silver in the "Best Milk Chocolate Bar," category and bronzes in the "Best Organic or Fair Trade Products," "Best Milk Chocolate," "Most Exciting Experience," and "Most Delicious Ingredient Combinations" categories. A silver medal for Best Caramel went to Newark's Landru Chocolates, home of such unbelievably lush confections (which should really be much more famous hereabouts) as the Orange Latte Truffle, the Lavennise, the Landrumenthe, and the Mochazin. As if that wasn't enough, Landru also makes chocolate-dipped wine and fruit jellies. Landru also scored a bronze for Best Flavored Chocolate. 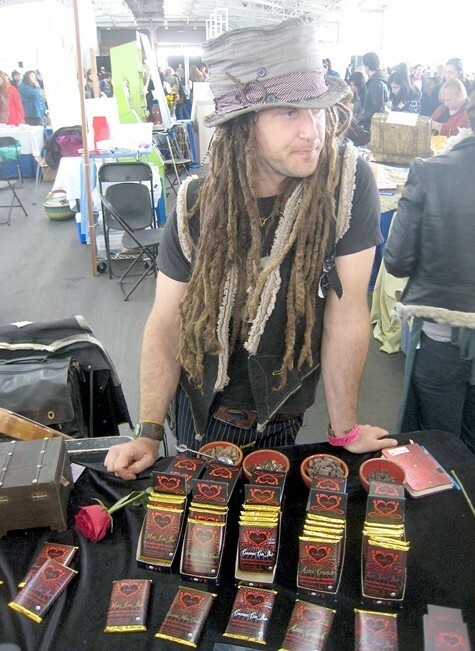 Berkeley's Clarine's Florentines won bronzes in the "Best Comfort Chocolate," "Most Luxurious Chocolate Experience" and "Most Delicious Ingredient Combinations" categories. Oakland resident Adam Hubenig at Lulu's. My own personal list of chocoknockouts includes a Parmesan/tomato paste/anchovy/porcini-infused umami truffle from Petaluma's Salt Side Down, 100 percent raw chocolates flavored with Andean maca root from Sedona, Arizona-based Lulu's Chocolate — "We don't roast our beans," said Oakland resident Adam Hubenig, who works for Lulu's — rosewater caramels from Atlanta's Cacao Atlanta, and just about everything from Nicaragua's Momotombo, whose infinitely earthy goodness might very well transport you to another planet.